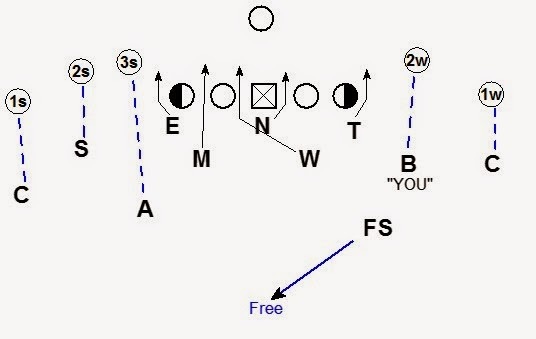 This blitz was submitted by Blitzology reader Jeff Koutsantanou. Coach Koutsantanou is currently the Linebackers coach at the United States Merchant Marine Academy. Coach Koutsantanou’s Rambo blitz is an adjusted blitz concept run from a 3-4 defensive alignment. The adjustment of the blitz is determining which linebacker will blitz (Mike or Blood) based on the alignment of the running back. The blitz is backed up by man free coverage. Coach Koutsantanou likes this concept against 10 or 11 personnel on 2nd & long or 3rd & obvious pass. 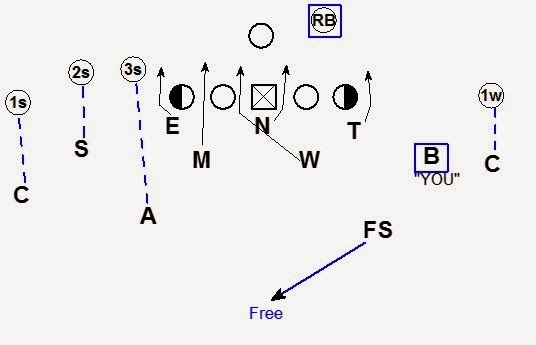 If RB is aligned to your side = Man to Man on RB. This is a rush & engage coverage technique. Force the RB to account for you in the protection. Here the Mike is aligned to the RB so the Mike has him man to man. The Blood is away from the RB and is the blitzer. The Blood must call "Me" to tell the Tackle who has the contain rush. Here the Blood is manned on the RB and the Mike is blitzing. The Blood makes a "You" call to the Tackle telling him who has contain. The Nose, Will, and End remain constant regardless of the alignment of the RB. This concept has natural angles for the Mike to blitz the B gap or for the Blood to blitz off the edge. 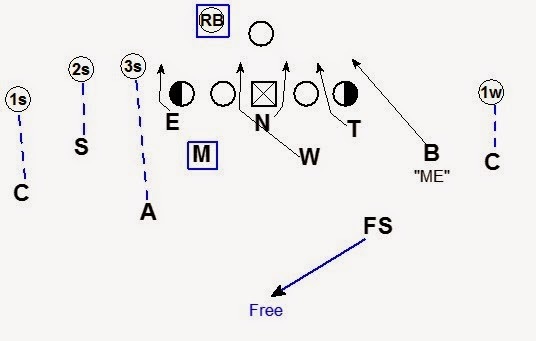 Against a 3x1 formation the Anchor takes #3 strong and the FS is free. All the other rules remain the same. Coach Koutsantanou's base answer is to treat a pistol backfield as strong. In that case the Mike is man to man on the running back while the Blood is blitzing. The call can adjust to empty or the call can be checked. 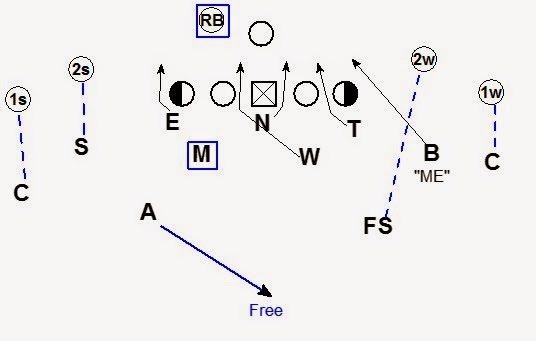 #2 Offenses flipping the alignment of the running back from one side of the center to the other. Coach Koutsantanou's base answer is reset the blitz with the flip of the RB. Coach Koutsantanou's handles these teams by game plan. This pressure is favored by Coach Koutsantanou because it is simple to install. The defense can present multiple blitz looks to the offense with a single call. The call's versatility is good vs. hurry up offense. 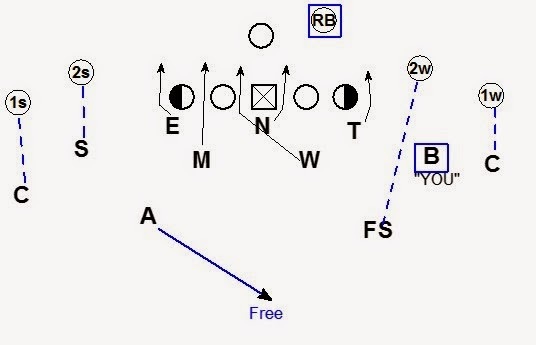 As the offense goes fast and changes the alignment of the back the blitz changes. 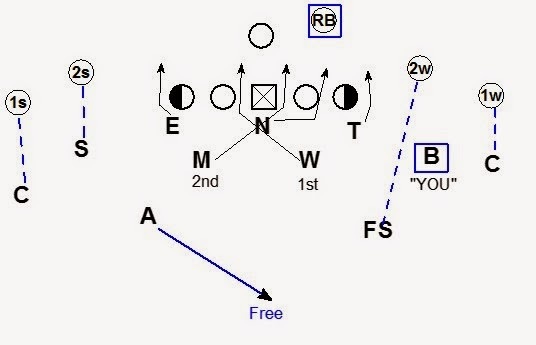 Coach Koutsantanou uses this template for other blitz variations. 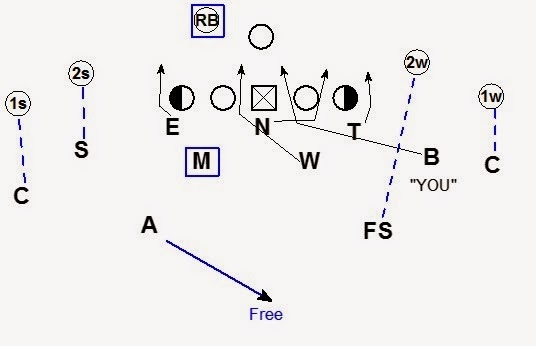 Coach Koutsantanou's Rambo X concept is one example of a blitz variation using the same principles as Rambo. The coverage rules remain the same. The only adjustment is the blitz path for the linebackers and the Nose. On a Rambo X call the Nose slants to the away B gap. The Blood cheats his alignment to blitz the B gap. On a Rambo X call the Mike blitzes the opposite A gap. The Mike should let the Will clear before blitzing. Thanks to Coach Koutsantanou for e-mailing me. If any other coaches would like to submit any aspect of their playbook to be featured on the site please e-mail me. In this particular blitz there is an open gap... For an example, in the last diagram (Rambo X), the left B gap is vacant. So who will be responsible for that gap?